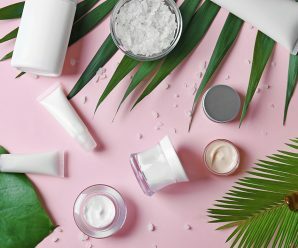 Who knew Nivea could replace all these products? 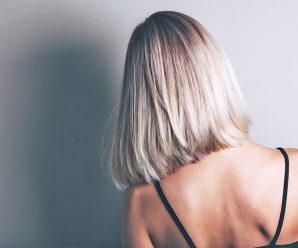 Everybody has a certain smell that reminds them of their childhood, whether it’s their mom’s cooking, their dad’s cologne, or a type of flower that blossomed year after year in the family garden. My childhood smell is Nivea creme. I remember seeing the blue tin in our bathroom cupboards – it was always there and never seemed to run out. Now I know that’s because my mom would make sure to buy a new one whenever it was time to scrape the last bit of product from the bottom of the jar. She used it on her own body and on mine, mainly to moisturize our legs and arms, and whenever she did, the smell would follow us around the entire day. Trying to describe what Nivea smells like is impossible, because, well, it simply is the ‘Nivea smell’ (a quick glance at the ingredients reveals it’s rose and lilly of the valley). In fact, it’s become so iconic, Nivea released a fragrance in its home country Germany a few years ago which gives you the scent of the creme in the form of an eau de toilette. 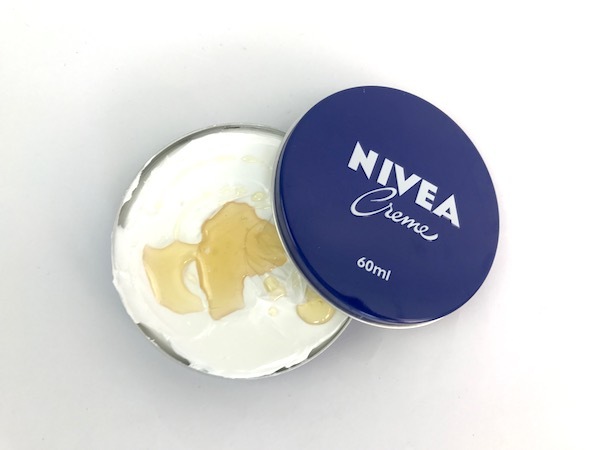 Ever since the creme was created back in 1911, Nivea has become of the most successful cosmetic brands worldwide, selling everything from cremes and lotions to deodorants and even haircare products. 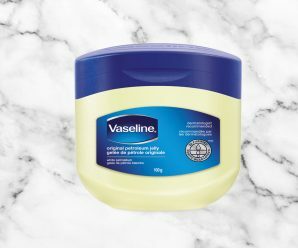 Similar to Vaseline, Nivea has become a staple in most people’s bathroom cabinets; a go-to product whenever you need a good-quality, reliable moisturizer. 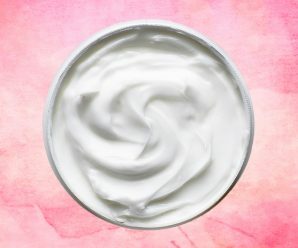 Ingredients like glycolerin and lanolin are very effective at locking in moisture, however, as I’ve recently learned, the iconic creme can do way more than just keep your skin soft. For reasons I cannot explain, as I’m not a chemist, Nivea creme works exceptionally well as a leather treatment. Have a bag that looks worn-out or even scratched? Rub some Nivea on the spot to revive the color and make scratches less visible. Got some leather shoes that look a bit dull? Give them a good polish with the white stuff. Nivea doesn’t leave oil marks or stains on leather and does a great job at smoothing out small scrapes and scratches – although it probably depends on the type of leather and I would highly recommend trying it on a discreet spot inside the bag first to ensure it doesn’t leave a trace. 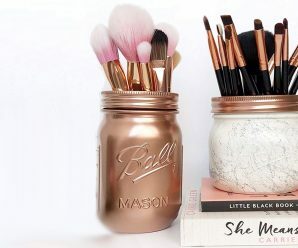 If you have a lipstick or lip gloss whose shade you love, just mix a small amount with some Nivea cream to create a matching tint you can use on your cheeks. I used a matte gloss for this and really liked the light, sheer texture of the resulting concoction. It worked really well as a cream blush, as well as a lip tint, which also hydrated my pout. Genius! 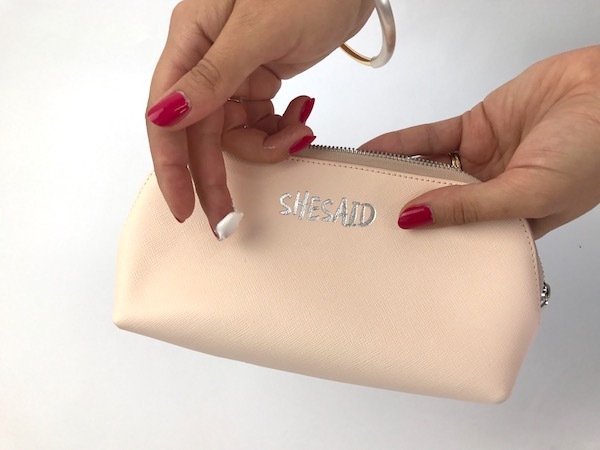 While the product might feel a little too heavy to act as an everyday hand cream, it’s ideal to use as cuticle cream. If you’re prone to dryness or even painful tears in your cuticles, massaging in some Nivea creme once a day will keep the barrier between nail and skin moisturized and healthy. 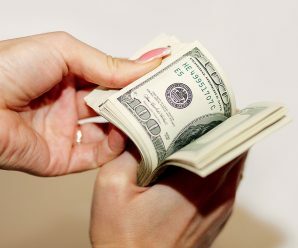 It’s also a lot cheaper than many cuticle oils, and also more efficient, as you can do it at the same time you moisturize your body. I was a bit apprehensive about this suggested use, as I have quite sensitive skin, but after reading about several women who use Nivea on their face every day and swear it’s better than some high-end face creams, I bit the bullet and gave it a go. 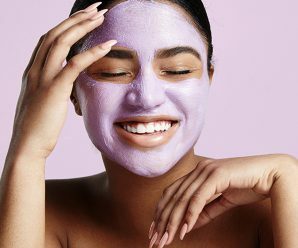 Just add a tablespoon of honey and a spoon of Nivea cream to a small bowl and whisk with a fork until well combined, then apply to your face and leave to sit for 10 minutes before rinsing off with warm water and your everyday cleanser. The mask is antibacterial thanks to the honey, and deeply hydrating and anti-ageing thanks to the Nivea creme. Use once a week for best results. 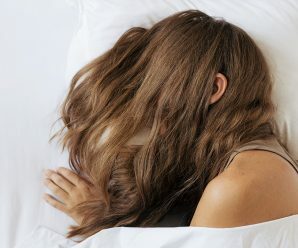 It’s a whole lot cheaper than a store-bought face mask, and left my skin glowy and dewy. Another surprisingly easy DIY beauty product is a Nivea sugar lip scrub. 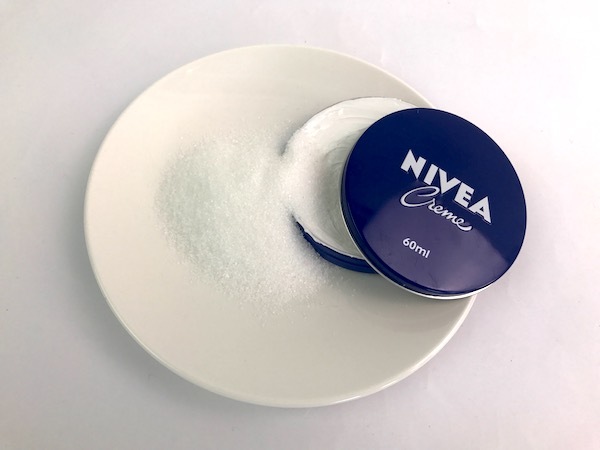 Just mix a teaspoon of Nivea with a spoon of sugar, apply to your lips, and gently scrub to remove dead skin. 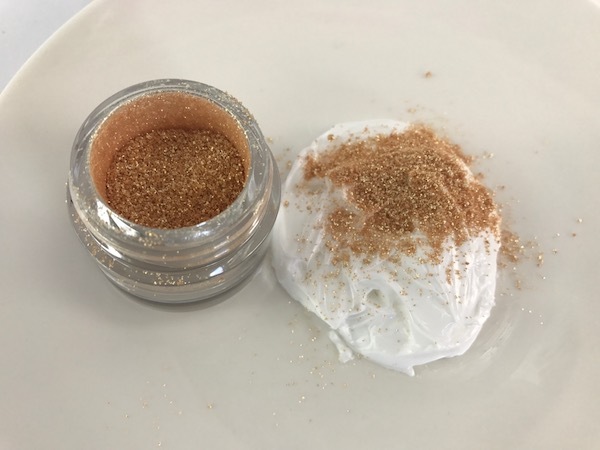 Contrary to my expectation that the sugar would simply melt into the cream, it actually stayed grainy and provided a perfect lip exfoliation, leaving my kisser soft and plump with the added bonus of a subtle sweetness on my lips afterwards. 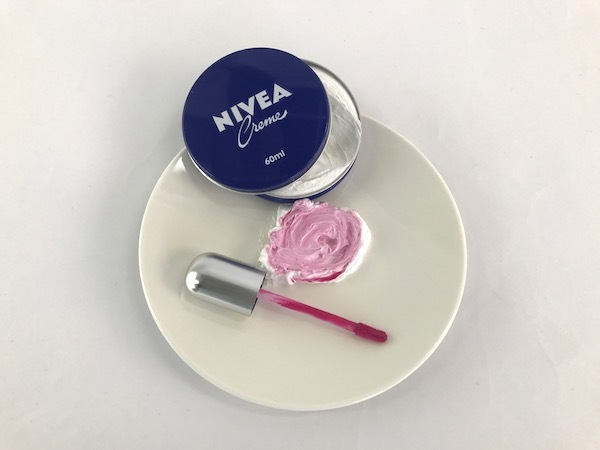 This was probably the most surprising and impressive Nivea hack I tried, as the result was so good, I’ve actually since replaced my store-bought highlighter with this DIY version. 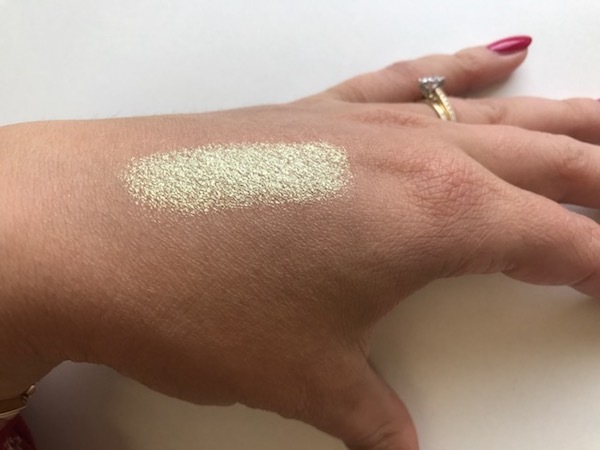 To create a highly reflective, super dewy highlighter, all you need to do is mix a generous pinch of shimmery eyeshadow powder in your desired highlighter hue (I used a soft gold) with a teaspoon of Nivea creme. 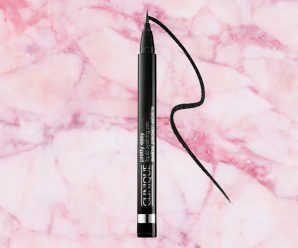 Swipe the mixture over cheekbones for a moisturizing highlighter that packs a serious punch. 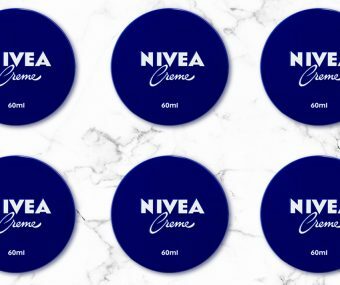 Comment: What other uses for Nivea creme do you know of?